I have been on a big soup kick lately for lunches. It is quick, healthy and fills you up. Now, I have also had some dried cheese tortellini calling my name but did not know what to do with it until late this week. Make some yummy soup with what I have in the house and that is what I did today. This is a recipe that I whipped up just using what I had on hand. You can omit the Cream of Chicken soup if you would want a clear broth soup. I have to admit that it is quite tasty. Add chicken broth, frozen veggies and ground pepper in a large pot and cook on low. 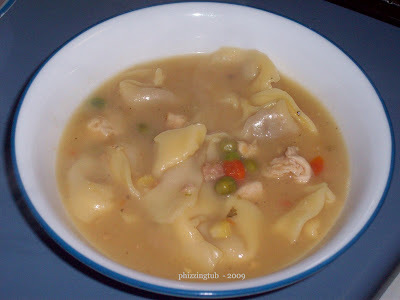 About ten minutes later, add in the tortellini and whisk in the Cream of Chicken soup. In a pan cook chicken tenders with garlic powder, onion powder, and ground pepper to your taste. Once fully cooked, add the chicken to the big pot. Add in your parsley and mix. Cook for roughly an hour on medium low heat. Per Serving: 189 Calories; 3g Fat (13.5% calories from fat); 23g Protein; 18g Carbohydrate; 2g Dietary Fiber; 63mg Cholesterol; 287mg Sodium. Exchanges: 1 Grain(Starch); 1/2 Lean Meat; 1/2 Vegetable; 0 Fat. When cooking the chicken tenders use garlic powder, onion powder and pepper to taste. OH YUM!!!!! I would have to pick out the peas.. LOL LOL.. but it looks AMAZING!!! I have to say it is quite tasty.